Phytoplankton not only form the base of the aquatic food web, but these microscopic primary producers also genrate much of the oxygen required to support life on Earth. Warming and other climate-related changes affect ocean chemistry and marine organisms such as phytoplankton that play a vital role in the cycling of elements like carbon, oxygen, and nitrogen. A recent study published in Science (1), reporting data from an ocean time-series in New England coastal waters, shows that spring phytoplankton blooms now occur earlier in response to warmer water temperatures. Such climate-driven shifts in bloom phenology affect the function of marine food webs and ultimately the ocean’s capacity to sequester carbon. Since many of Earth’s natural rhythms operate on interannual to decadal time scales, time-series must ideally be sustained for multiple decades to statistically distinguish anthropogenic changes from natural variability (2). 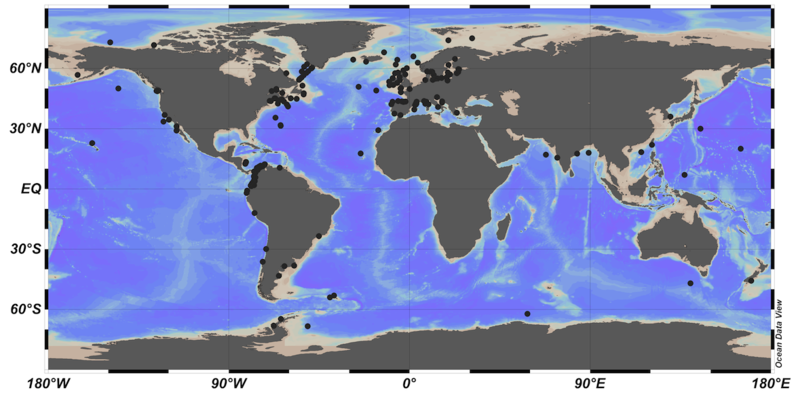 But financial commitments required to maintain ocean time-series limits the number of sites where these critically important observations are made. Yet, long time-series have revealed striking changes in marine ecosystems, including: Trends of increasing ocean acidity as a consequence of rising atmospheric CO2 (3); changes in the biogeography of major phytoplankton species in response to changing ocean conditions and circulation (4); and changes in commercial fisheries and associated food webs tied to anthropogenic changes and natural climate phenomena (5). In anticipation of the 22nd Conference of the Parties of the United Nations Framework Convention on Climate Change, we draw attention to the critical role of sustained ocean ecological and biogeochemical time-series measurements in climate research and mitigation efforts (6). We urge increased support of ocean time-series and international collaboration (7) to foster methodological best practices (8, 9), data sharing, and synthesis (10). These long-term measurement programs provide an essential baseline to document change and improve our understanding of the processes shaping Earth’s largest ecosystem. 1. K. R. Hunter-Cevera, M. G. Neubert, R. J. Olson, A. R. Solow, A. Shalapyonok, H. M. Sosik, Physiological and ecological drivers of early spring blooms of a coastal phytoplankter. Science 354, 326-329, doi:10.1126/science.aaf8536 (2016). 2. S. A. Henson, C. Beaulieu, R. Lampitt, Observing climate change trends in ocean biogeochemistry: when and where. Glob. Change Biol. 22, 1561-1571 (2016). 3. N. R. Bates, Y.M. Astor, M.J. Church, K. Currie, J.E. Dore, M. González-Dávila, L. Lorenzoni, F. Muller-Karger, J. Olafsson, J.M. Santana-Casiano, A time-series view of changing ocean chemistry due to ocean uptake of anthropogenic CO2 and ocean acidification. Oceanogr. 27, 126–141 (2014). 4. A. D. Barton, A. J. Irwin, Z. V. Finkel, C. A. Stock, Anthropogenic climate change drives shift and shuffle in North Atlantic phytoplankton communities. Proc. Nat. Acad. Sci. 113, 2964–2969 (2015). 5. S. McClatchie, J. Duffy-Anderson, J.C. Field, R. Goericke, D. Griffith, D.S. Hanisko, J.A. Hare, J. Lyczkowski-Shultz, W.T. Peterson, W. Watson, E.D. Weber, G. Zapfe, Long time series in US fisheries oceanography. Oceanogr. 27, 48–67 (2014). 6. A. K. Magnan, M. Colombier, R. Billé, F. Joos, O. Hoegh-Guldberg, H.-O. Pörtner, H. Waisman, T. Spencer, J.-P. Gattuso, Implications of the Paris Agreement for the ocean. Nature Clim. Change 6, 732-735 (2016). 8. M. J. Church, M.W. Lomas, F.M. Karger, Sea change: Charting the course for biogeochemical ocean time-series research in a new millennium. Deep-Sea Res. II 93, 2-15 (2013). 9. L. Lorenzoni, H. M. Benway (Eds. ), Report of Global intercomparability in a changing ocean: An international time-series methods workshop, November 28-30, 2012, Ocean Carbon and Biogeochemistry (OCB) Program and International Ocean Carbon Coordination Project (IOCCP), 61 pp. (2013).